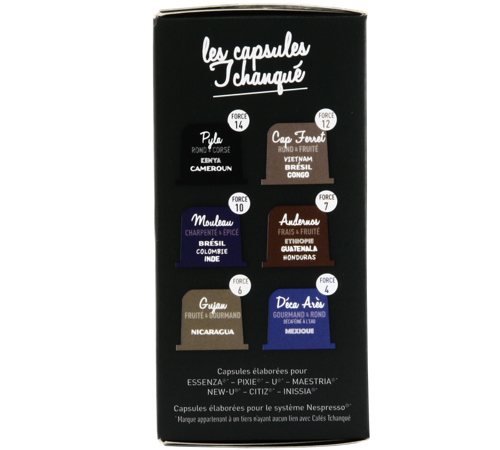 Discover these Cafés Tchanqué capsules, compatible with Nespresso® . A selection pack of 60 capsules, 6 different coffees. These capsules were born in the Arcachon Bay in the South of France, made by real coffee lovers who wanted to create a range of coffees to share with their community. Each coffee is named after a local town or local area. 6 boxes of 10 capsules, 100% airtight with no extra packaging. Made in France. 10 x Gujan capsules : Exclusive micro-lot from Nicaragua, 100% Arabica. Mild coffee with fruity notes. 10 x Arès capsules : Decaffeinated mild coffee. 100% Arabica from Mexico. 10 x Cap Ferret capsules : 100% Arabica blend from Vietnam, Brazil & Congo. Strong coffee with fruity notes. 10 x Andernos capsules : 100% Arabica blend from Ethiopia, Guatemala & Honduras. Balanced coffee with fruity notes. 10 x Moulleau capsules : Blend of Arabica & Robusta from Brazil, Colombia, India. Strong coffee with spiced notes. 10 x Pyla capsules : 100% Arabica blend from Kenya and Cameroon. Strong intense coffee. 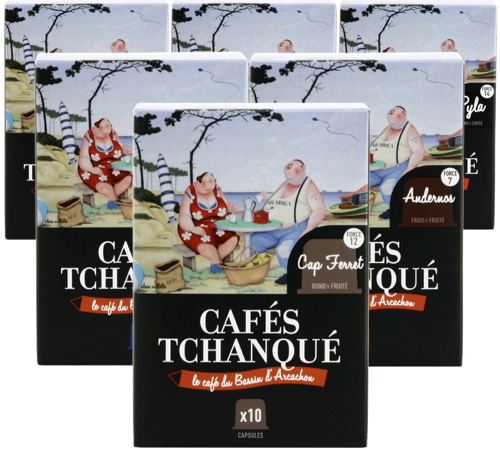 Cafés Tchanqué is a brand of coffee founded in Arcachon Bay by a coffee enthusiast (and lover of the Bay) who wanted to create a range of coffees dedicated to sharing and friendship. Nespresso compatible capsules, coffee beans... Take a quiet moment to enjoy these coffees, while thinking of a place that is dear to your heart.